Facebook Ads - What Am I Doing Wrong? Recently on this blog I published an article titled “Facebook advertising: Is it worth investing in?” and some of you have shared your experiences with Facebook advertising with me both as comments on the post, via inbox and on Facebook. Today I have decided to answer some of the questions most of you have been asking. Facebook advertisement is a dynamic program in the sense that what works for me may not work for you. But understanding the factors that determines if a Facebook ad will do well or not can give one a great insight into why one may not be doing well with Facebook advertisement. So if you have been spending huge amount of money on Facebook advertisement and haven’t been getting your desired results, here are some of the things you may have been doing wrong. Are your headlines and descriptions compelling enough? You have just 25 characters and 135 characters for your title and descriptions respectively. So you need to make the best of it while setting up your Facebook ads. Your title need to be catchy enough to raise your audiences’ interest in your ads, tease them a little more on your description and remember to add a call to action to compel them to engage on it. Call to action: Every successful Facebook ads have something in common – call to action. Call to action is what compels people to take an action on the ad else they may just read it and move on. Which of ad 1 and ad 2 do you think will convert more? Of course the second, because you have asked your audience to do something. So the next time you create a Facebook ad, ensure to add a call to action to it to compel your audience to take an action such as LIKE, SHARE or even COMMENT. Targeting Wrong Audience: Another mistake you may have been making and the reason why Facebook advertising may not have worked for you is that you may have been targeting the wrong audience. Promoting a weight loss post to people who are not interested in it is definitely a waste of resources and effort. Facebook made provisions for broad and exact match advertisement. Targeting a broad audience may not do you well if you product is specifically for a few targeted people. You need to be able to use the available tools on your Facebook ad manager to narrow your audience to the best and most interested people who are most willing to engage on your ads. You can narrow your audience by location, age, interest, gender etc. Advertising a product for men to women may not convert as much as when it is targeted to just men. While some ads may do well when broadly targeted, others may not. So you need to first of all understand your audience and then be able to mount a data-driven campaign. CPM vs CPC: What bidding model do you adopt? Another thing you may have been doing wrongly in Facebook advertising is bidding model Facebook has several bidding options such as CPC, CPM, Optimized CPM and CPA. When bidding, know how much you can afford to pay per click or for 1,000 impressions. Of course, it may not always be possible to have this knowledge, especially if you are new to Facebook. Fortunately, Facebook doesn’t make you bid blindly. You’ll be provided with a suggested minimum, maximum and median bid. The main thing to remember: you are setting a maximum bid, or a “ceiling price.” This means that while you are unlikely to pay this much for clicks or impressions, you could pay up to it. On average, you will pay a discounted value of whatever is necessary to win the auction, based on what the marketplace is suggesting. Facebook will optimize your ads to help you pay the least amount of money per thousand impressions or per click while moving toward your campaign goal. However, there are actions you can take to ensure you’re spending your money wisely. If you see your costs rising over the course of a campaign, you’re targeting or ad creative may need tweaking. Look at the images, copy and target groups that are most receptive to your ads and hone in on them to lower costs. Testing is an easy way to see what’s working and what’s not…in real time. Another mistake you may have been making that has made Facebook ads not to work for you may be the type of images you use on your ad. Images you use for Facebook ads must be eye-catching because most Facebook users are not in an information-gathering or product-purchasing mindset – they’re simply there to hang out with friends. To fix this, it is important that you choose an image to pair with your ad that’s both eye-catching and relevant to your promotion. If you’re seeing a low CTR on your ads, the specific image you use should be one of the first elements you test. Using the wrong type of Facebook ad? This is one place most people get it wrong with Facebook ads. 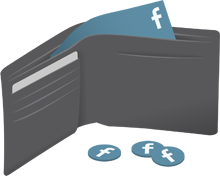 Facebook offer a good number of different ads such as like ads, engagement ads, click to website ads etc. If your ads are not giving you the desired results, it is possible you may have chosen the wrong type of ad for your target market. Experiment with other type of ads to see if you can get better results. Another reason your Facebook ads may not have been doing well may be because the ads have little or no interaction at all. Many Facebook ads aren’t engaging enough. People will find them boring and will not click on them at all. What worked for me are ads that ask questions to people whom I am targeting. Getting Facebook ads to work for you means getting the above discussed factors right. I experimented with a lot of options till I found what worked for me. You should tweaking your ads until you get your desired results. Facebook advertising is quite dynamic and just as I said earlier what worked for me may not work for you. So you should be able to find what will work for you considering the factors I have shared in this article. Let me know your challenges of Facebook advertising or why you think it may not be working for you in the comments.